9 April 1747: 80-year-old Lord Simon Fraser of Lovat was the last person to be executed at Tower Hill after he was sentenced for his part in Bonnie Prince Charlie's rising. Tower Hill, the site of many executions, is an elevated spot to the north west of the Tower of London. 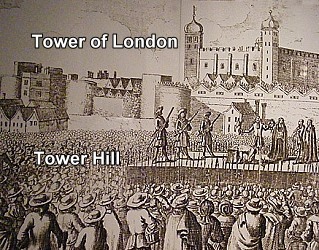 Tower Hill served as the public execution place for all traitors, while Tower Green outside the White Tower was reserved for Royal executions. Anne Boleyn and Catherine Howard were both executed on Tower Green. Between 1388 and 1747, more than 130 men and women were killed by beheading on Tower Hill or Tower Green (inside the Tower of London). 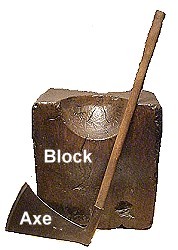 The usual implement used for beheading was the axe. On very rare occasions the sword was used, such as in the case of Anne Boleyn's execution. Killing the lower classes was usually achieved by hanging from the gallows.